Big Wheel Building: Hot diggity damn! Devin's been evolving these things for over 4 years (by my count anyway--potentially much longer by his). The first few times he mentioned them to me I only halfheartedly listened as I thought he was trying to convince me to use skis (instead of wheels) on my AK trips. Once I listened more closely I was interested, so I joined him for an on-mountain demo day and was just blown away. 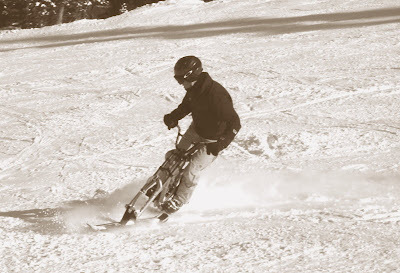 I've ridden various skibikes and ski bobs since I started skiing 25 years ago, and they were all sort of kind of neat in a novelty sort of way. But you couldn't really rip on them--you just kinda rode delicately and survived. Devin's new bikes have nothing in common with the old-style bikes and bobs. See the vid below to understand what I mean. He's built several iterations of the frame, countless tweaks to the ski mounting and tensioning systems, and several different skis with different sidecuts to get them just right. It just blows me away that he makes the frames, fixtures, skis, saddles, etc... in house. I think the only things he doesn't manufacture personally on these bikes are the fork, shock, headset, stem, and bars. The learning curve on these things is just unbelievably easy. Not to say that you can't stack and hurt yourself--hell you can do that with just two feet, no need for a contraption to facilitate it! I just mean that it takes all of about one run down a hill to grasp the basics of turning and stopping. Having only spent ~7 hours total on one (and spread out over 3 years...) I'm a pretty rank beginner. But still--I had no trouble carving and skidding turns on my first run down today, and by the end of the day I'd spent some time out in the chunk and freshies as well. The firmer the snow is (short of ice), the easier it is to learn the skills, but the more you learn the more you want to spend time out in the soft stuff. So the game becomes balancing the skills you have with the ones you want to have. Great fun. Here's some video that Devin shot of some of his buds riding last winter. It also answers a lot of the questions that people have--like how easy it is to get on and off of a lift. I know that Vail, Copper, Winter Park, A-Basin, Telluride, and Durango/Purgatory all allow these on their lifts. Probably many others do too--call 'em to find out. Having ridden one of his team DH bikes with the adapter kit, and then experimenting with this dedicated skibike, there's no doubt that the dedicated one does a lot of things better--like short radius turns, bumps, and getting onto/off of the lift. Probably sounds a lot like a sales pitch right about now, eh? Well, I'm not selling them, just really psyched to have one. Heading to the desert this weekend to ride dry dirt in shorts, but really looking forward to getting back and doing more cross-training in the snow. That is frickin sweet! I want one! I saw those at Interbike in Devin's booth. Very well made. I was impressed. I've seen others that certainly pale in comparison. You know, we're having the first winter in years here that would make me want one of those!